The tension does not come from the tempo; the rhythm does not come from the percussion, but from the basses, violas, the second violins. You must play a waltz like a flower. But you must keep the musical thread taut from the first bar of the introduction to the last bar of the coda. On the way you must never let the tension slacken, at the end of each of the five waltzes (in the classical form of the Viennese waltz); the music must always keep going, and never forget that a waltz, even a concert waltz, is still essentially dance music: you must play it in such a way that you can always still dance to it, that is to say not too quickly and avoid making too many variations in tempo, all those rubatos, which are nowhere to be found in the score! Like his grandfather Eduard Strauss I (15 March 1835 – 28 December 1916) Eduard II travelled through many countries in the world. 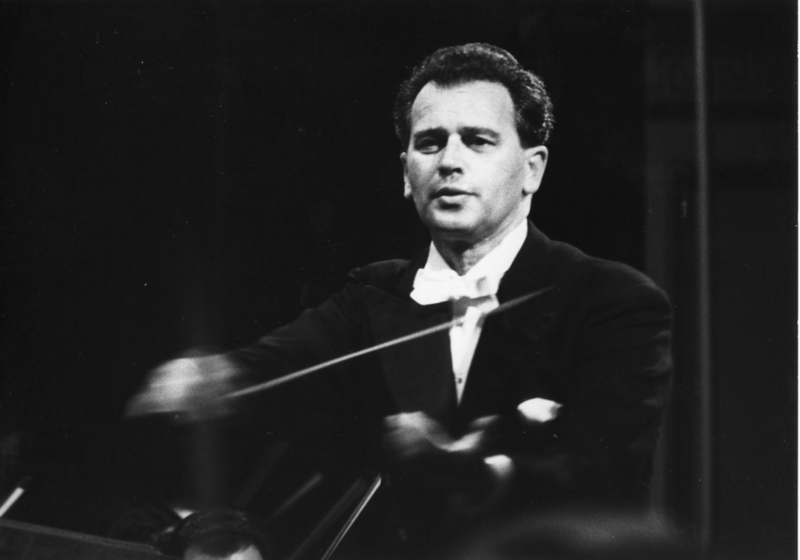 In autumn 1966 he went on a lengthy tour of the USA and Canada with the Vienna Johann Strauss Orchestra, newly founded specially for this and still in existence today. And so there, with a Viennese orchestra of the same size, he continued where his grandfather had, sixty-five years earlier, disbanded the famous Strauss Orchestra. 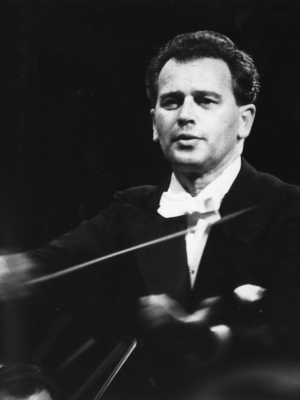 But his greatest achievement was to ‘conquer’ the Far East for the music of the Strausses in the course of six lengthy tours undertaken between 1956 and 1967 with the Tokyo Symphony Orchestra, which at that time consisted exclusively of Japanese musicians. These concerts were given with the title ‘An Evening in Vienna’. On 27 December 1950 he married Elisabeth, née Pontes (1919 – 2001), whom he had got to know while she was studying as a singer at the conservatory of the City of Vienna, where he had worked as a répétiteur in the opera class before his career as a conductor. On 6 April 1969, an Easter Sunday, Eduard Strauss II, the last practising professional musician in the family, died completely unexpectedly in Vienna. An so what has now been lost for ever is that special atmosphere when during 150 years of family tradition it was announced, ‘Today Strauss is playing,’ and one of the family’s musicians mounted the rostrum in order, as it were, to further his own cause. More detailed information can be obtained from the family archive on request to his son, Dr Eduard Strauss. This provides comprehensive documentation of the life and work of Eduard Strauss II. To mark the twentieth anniversary of his death in 1989 his widow Elisabeth and his son Dr Eduard Strauss, with the assistance of Dr Gerta Knapek and Dr Friedrich Klose in Coburg, Germany, published privately a commemorative booklet which presents and documents the twenty years of Eduard Strauss II’s career as a conductor on the basis of contemporary reports and reviews. To mark the centenary of his birth in 2010 Dr Eduard Strauss revised this publication and on 17 March 2011 the resulting volume Eduard Strauss II. – Ein Künstlerleben (An Artist’s Life), was presented in the Palais Coburg in Vienna as part of that year’s Tanz-Signale/Dance Signals symposium (for programme click adjacent link). The book was published by Hans Schneider in Tutzing, Germany, and can be bought from the publisher for EUR 12.50. Link to article about the book by Prof. Georg Markus in the Vienna daily Kurier, 3 May 2011.